Lyme disease is caused by a spirochete, Borrelia burgdorferi. A spirochete is a type of bacterium. "Lyme disease is transmitted to dogs through the bite of a tick." Lyme disease is transmitted to dogs through the bite of a tick. Once in the blood stream, the Lyme disease organism is carried to many parts of the body and is likely to localize in joints or kidneys. 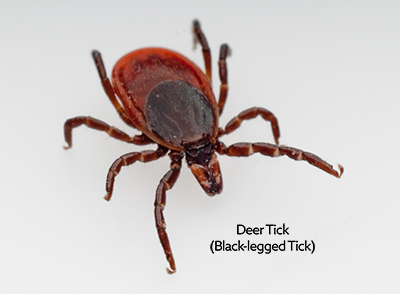 The most common type of tick to carry Lyme disease is the deer tick (also known as the black-legged tick). Deer ticks are distributed through the Midwest and eastern United States, as well as throughout Canada with the highest proportion in Ontario. What are the clinical signs of Lyme disease? Some people with Lyme disease develop a characteristic bull's-eye rash at the site of the bite within three to thirty days. If this occurs, the disease can be easily diagnosed at an early stage. However, signs of Lyme disease are more difficult to detect in animals than in people. The characteristic rash does not develop in dogs or cats. In fact, Lyme disease is practically unheard of in cats. "Affected dogs have been described as if they were walking on eggshells." Many dogs affected with Lyme disease are taken to a veterinarian because they seem to be experiencing generalized pain and have stopped eating. Affected dogs have been described as if they were walking on eggshells. Often these pets have high fevers. Dogs may also begin limping. This painful lameness often appears suddenly and may shift from one leg to another. If untreated, it may eventually disappear, only to recur weeks or months later. Some pets are infected with the Lyme disease organism for over a year before they finally show symptoms. By this time, the disease may be widespread throughout the body. Non-specific signs which may indicate that Lyme disease is affecting the kidneys include vomiting, lethargy, anorexia (lack of appetite), and weight loss. The kidney form of the disease is less common, but often fatal. Dogs with lameness, swollen joints, and fever are suspected of having Lyme disease. However, other diseases may also cause these symptoms. There are a few blood tests that may be used for confirmation. The first is an antibody test, often referred to as a Snap4Dx test and can be done very quickly at your veterinary clinic. This test detects the presence of antibodies created by exposure to the organism. A test can be falsely negative if the dog is infected, but has not yet formed antibodies, or if it never forms enough antibodies to cause a positive reaction. It is recommended to test no earlier than 4 weeks after a tick bite. Some dogs that have been infected for long periods of time may no longer have enough antibodies present to be detected by the test. Therefore, a positive test is meaningful, but a negative is not. A follow up test called a QC6 test can be done to assess the numerical antibody level as confirmation. Other tests including PCR (polymerase chain reaction), ELISA (enzyme-linked immunosorbent assay), joint fluid analysis, and culture can also be done with varying degrees of sensitivity, but are done less commonly. General blood and urine tests are also often done to assess kidney function and look for loss of protein in the urine. See handout “Testing for Lyme Disease in Dogs” for further information. Because the Lyme spirochete is a bacterium, it can be treated with antibiotics. The antibiotic of choice is doxycycline, followed by amoxicillin, then azithromycin. Treatment lasts for 4 weeks. Occasionally, the initial infection will recur, or the pet will become re-infected by being bitten by another infected tick. The key to prevention is keeping your dog from being exposed to ticks. Ticks are found in grassy, wooded, and sandy areas. They find their way onto an animal by climbing to the top of a leaf, blade of grass, or short trees, especially cedar trees. Here they wait until their sensors detect an approaching animal on which to crawl or drop. Keeping animals from thick underbrush reduces their exposure to ticks. Dogs should be kept on trails when walked near wooded or tall grass areas. Vaccination against Lyme disease is recommended for pets that live in endemic areas or that travel to areas where Lyme disease is prevalent. "Vaccination against Lyme disease is recommended for pets that live in endemic areas or that travel to areas where Lyme disease is prevalent." There are also several products available that can help to kill these ticks and prevent disease transmission. Some products are available over the counter, while others are only available through your veterinarian. There are effective monthly preventatives that are typically applied to the skin at the back of the neck and represent a convenient method of control for these external parasites. This includes Frontline Plus (only available in the USA) and Advantix. In recent years, the topical Bravecto has been developed and lasts for 3 months when applied topically. Additionally, there are chewable products such as Nexgard and Simparica that are given monthly or chewable Bravecto which is given every 3 months. Your veterinarian will make specific recommendations to keep your pet parasite free. Check your pet immediately after it has been in a tick-infected area. The deer tick is a small tick and only about pinhead size in juvenile stage, but is a little more obvious in the adult phase and after feeding. If you find a tick moving on your pet, the tick has not fed. Remove the tick promptly and place it in rubbing alcohol or crush it between two solid surfaces. If you find a tick attached to your pet, grasp the tick with fine tweezers or your finger nails near the dog's skin and firmly pull it straight out. There are also tools available called Tick Twisters or Tick Keys which can be useful. However, take care to use them cautiously as twisting or jerking the tick may cause the mouth parts to break off and remain in the skin. 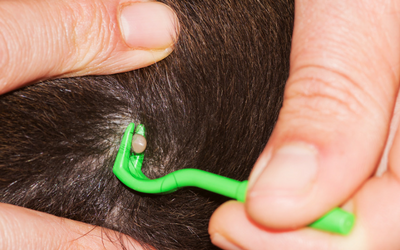 See your veterinarian if you are unsure or unable to remove the tick from your dog. Make sure you protect your fingers from exposure by using a tissue or a disposable glove.You may need another person to help restrain your dog. Removing the tick quickly is important since the disease does not appear to be transmitted until the tick has fed for approximately 12 hours. If you crush the tick, do not get the tick's contents, including blood, on your skin. Note: The bacterium that causes Lyme disease can pass through a wound or cut in your skin. Is there a vaccine that will protect my dog from Lyme disease? A safe and generally effective vaccine is available for protecting dogs against Lyme disease. This vaccine is initially given twice, at two- to four-week intervals. "Annual revaccination is necessary to maintain immunity." Annual revaccination is necessary to maintain immunity. Vaccination against Lyme disease will be determined by your pet's lifestyle and individual risk assessment. Be sure to discuss any questions you may have regarding the type and frequency of vaccination with your veterinarian.